I love high end cosmetics, but I also love scoring a great deal. Right now Covergirl is offering printable coupons for $4 off Coloricious Lip products and $4 off Lashblast Mascaras (once you register on their site etc., you can print them out)! That is more or less a discount of 2/3 the price! Armed with these coupons I set out for Walmart, and I scored Covergirl Coloricious Lipstick in “Verve Violet – 370,” Covergirl Colorlicious Lipgloss in “Candylicious – 620” , and a Full Lash Bloom Mascara in Very Black -800, for a total of about $7. Today I’m going to show you the Lipstick and Lipgloss. The formula of this lipstick is almost too weightless for me. It goes on with really no discernible texture or thickness. (I happen to like lipsticks that are waxy and thick, but I think many women like the opposite.) It does provide a bit of slip, which I like. And it also didn’t seem drying. It doesn’t have a smell or a taste. Regardless of the thin texture, the color, in my opinion, goes on incredibly well for a drugstore lipstick. 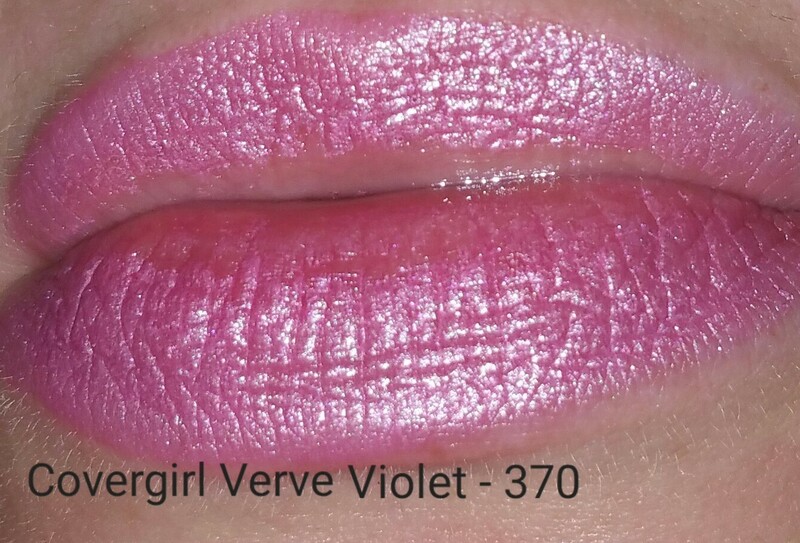 I chose Verve Violet – 370 because I didn’t really like the other colors in the store. I ended up selecting perfectly for myself! This is a very cool, blue, pinky-purple color with iridescence and a metallic sheen. I wouldn’t pull this out to wear just any day, but it’s a really cool look for the right situation. The lipstick isn’t a long-wearing formula, but I was surprised that it did stay with me through some snacking and drinking. I had forgotten all about the lipstick and was caught off guard when I looked in a mirror and saw it was still on! I can’t remember the last time I wore Covergirl Lipgloss, but when I applied this gloss I had an olfactory flashback and knew that the smell hadn’t changed since I wore it last. The lip gloss has a vanilla-ish, sweet smell to it. It’s not quite vanilla but I know for sure it’s also not floral or fruity. I enjoy it. Here I also picked a perfect color for myself. Candylicious is similar in color to Verve Violet, but it’s less purple in shade, less bright, and the finish is more holographic. I can’t say I’ve used another lip product with a color like this. I love how it looks in the tube and on my lips! 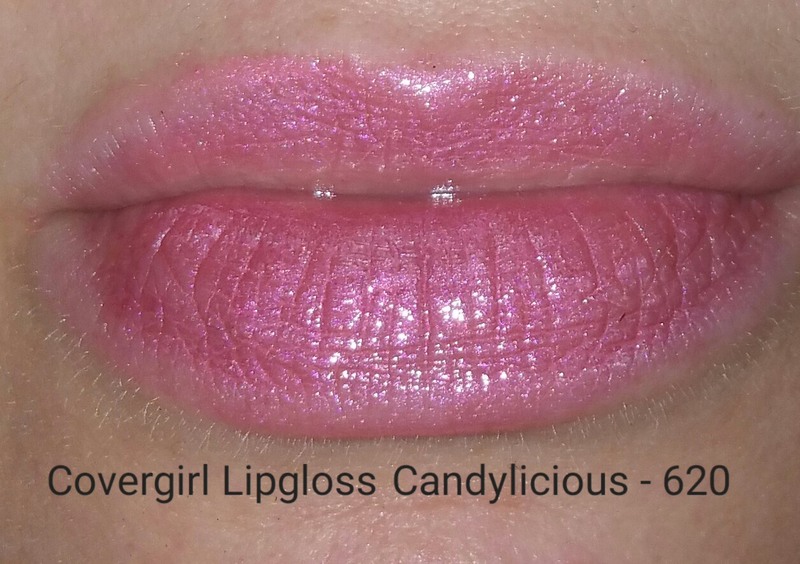 This is not a long-wearing gloss nor does it leave a stain on the lips. I’m definitely okay with reapplying my gloss, and often I prefer not to have a lingering stain on my lips. I am going to put my weight behind this statement and say that this is really an awesome drugstore lip gloss. The feeling is just right for me. I can feel it on my lips but it’s neither too wet nor too dry. I love the smooth feeling I get when I press my lips together. I haven’t tried the mascara I picked up. I may not even open it (and instead give it away) because I am almost always disappointed in mascaras I try… I’m loyal to my Définicils. However, I may try to print out another Colorlicious $4 off coupon and pick up another Covergirl Colorlicious Lipgloss! Hurry if you want to get these coupons. They don’t expire until the end of April, but who knows for how long they will be available to print.